UPDATED: Mon., Oct. 16, 2017, 4:34 p.m.
Is Bakken crude more volatile than other types of oil? Initiative opponents say Bakken oil, which is extracted through a process known as hydraulic fracturing or “fracking,” is no more volatile than conventional crudes. The report compared the Bakken oil to the more traditional “heavy crude” that is produced elsewhere in the United States. Trade groups have focused on the finding that Bakken oil shares a similar chemical makeup to other types of domestic light crude, rather than its comparison to the “heavy” version of the commodity that the Pipeline and Hazardous Materials Safety Administration report indicates is less volatile. Environmentalist groups have pointed to the report as proof that Bakken crude is more volatile. Legal certainty is a trait shared by those on both sides of the debate over whether Spokane should impose fines on coal and oil trains rumbling through downtown. The citizens group behind Proposition 2, which would fine the trains, argues that federal inaction has opened a window allowing the city to demand covered coal trains and the removal of combustible gases from rail-carried oil they say could cause a fiery explosion downtown. Their conclusion defies the opinions of two legal experts at City Hall, and the railroads and commodities groups have taken notice of the measure, spending tens of thousands of dollars on a campaign to defeat it at the ballot box. Mayor David Condon, who has contributed his voice to the campaign against the proposal, said although he understands the concerns of citizens about safety, imposing fines ignored federal actions to make the shipments less prone to derailment as well as efforts to improve emergency response. Supporters of the initiative, now dogged by allegations of campaign finance violations, insist their proposal is modest and would withstand a likely legal challenge. The union representing hundreds of local firefighters has endorsed their cause, saying a downtown derailment would be catastrophic. “The initiative was born from what these guys in the community have been warning us about, for at least the past six years that I’ve been here,” said Todd Eklof, minister of the Unitarian Universalist Church and the main sponsor and spokesman for Safer Spokane, the committee supporting the initiative. The question has split the Spokane City Council, seen by critics as an ideological monolith tilted toward the left. The proposal originated before the panel last year, with City Council President Ben Stuckart arguing the fiery explosion in Mosier, Oregon, necessitated local action. He later reversed course and said he preferred to work directly with the railroads and federal regulators to achieve change. Citizens gathered enough signatures to put the question before voters this November in a subsequent petition campaign. A total of $151,000 has been raised to defeat Proposition 2. Among the largest donors are Lighthouse Resources, a corporation that owns several coal mines in Wyoming and Montana, and the BNSF and Union Pacific railroads. The citizens group supporting the ballot initiative has raised just over $6,000, mostly from individual contributions. The largest contributor is Mike Bell, who is also serving as Safer Spokane’s treasurer. Stuckart said in light of recent rollbacks of some environmental regulations by the Trump administration, including rules on leasing federal land for coal mining, he’s now leaning toward voting for Proposition 2. City Councilwomen Candace Mumm and Amber Waldref said they have concerns about a protracted legal battle if the measure passes. Both said they likely will vote against the measure. City Councilwoman Karen Stratton wouldn’t comment on how she will vote, but said she, too, expected a legal fight. Councilman Mike Fagan is an outspoken critic of the measure, while his colleague, Breean Beggs, helped draft the ordinance and has been its staunchest defender on the council. The initiative’s opponents, including Condon, cite legal opinions from the city’s hearing examiner, Brian McGinn, and the City Council’s policy adviser, Brian McClatchey, that the measure would have a slim chance of surviving a legal challenge. Both men identified different sections of federal law to conclude that an ordinance passed at the local level would be trumped by rulemakers at the national level, opening the city to potential litigation and courtroom costs if the commodities, railroads or someone else filed a lawsuit to block its enforcement. Condon pointed to efforts underway at the federal level, including legislation introduced in Congress by Washington Sens. Maria Cantwell and Patty Murray, calling for national standards on cargo volatility and increasing funding for firefighting training. The city also has eliminated vehicular at-grade crossings with trains to reduce the likelihood of collisions within city limits, the mayor said. “That’s where I think we really need to focus our attention,” Condon said. The ballot measure would also fine uncovered coal trains over concerns about dust scattering to the tracks and increasing the likelihood of derailments. Opponents, including Sheriff Ozzie Knezovich, have seized on the inclusion of coal cars as evidence supporters are seeking to change environmental policy, not protect downtown. Initiative supporters say their specific requests that coal cars be covered and the oil extracted from the Bakken shale, an oil-rich patch in western North Dakota, be treated to reduce the vapor pressure, haven’t yet been addressed by federal rulemakers. They cite a 2000 case out of the 9th U.S. Circuit Court of Appeals to argue that in the absence of regulation, cities can step in. Bell, the Safer Spokane organizer and treasurer, said if the legality already was settled, the railroads would have filed a lawsuit before voters weighed in. BNSF spokeswoman Courtney Wallace said the campaign was “an opportunity to educate people about the value of rail.” The railroads have stressed that emergency responders work with the railroads on exercises to respond to a potential derailment, and that track inspections in the Spokane area occur even more frequently than required under federal law. The city didn’t make any pre-ballot challenge because the state values the initiative process, Condon said, and taxpayers may have spent money on legal proceedings that won’t be necessary if the measure is defeated. If the ballot measure is successful, it may not be a clear-cut victory for supporters of rail safety, said Fred Millar, a Washington, D.C.-based rail safety consultant who formerly worked for the environmentalist group Friends of the Earth. Millar said that would lead to another legal decision that continues to give Congress and federal rulemakers more authority in regulating rail. Proponents would be better served pushing for additional transparency from railroads on the type of cargo traveling through the city and pushing for explanations of why Bakken oil must be shipped through downtown, Millar said. Opponents warn that the initiative would have the effect of putting more oil cargo on the highways, where accidents and explosions could be more frequent than on the rails. They point to studies by the Federal Railroad Administration finding that trains are four times as fuel efficient as trucks and from the Congressional Budget Office showing trains pose a lower accident risk than trucks on the road. “I think the safety standards that are set by the federal government to our railroad carriers seem to be very high,” Condon said. Stuckart and the initiative’s sponsors said oil companies are unlikely to abandon rail, because it ignores the higher cost of trucking the commodities compared with lowering the vapor pressure of the oil and covering coal train cars. 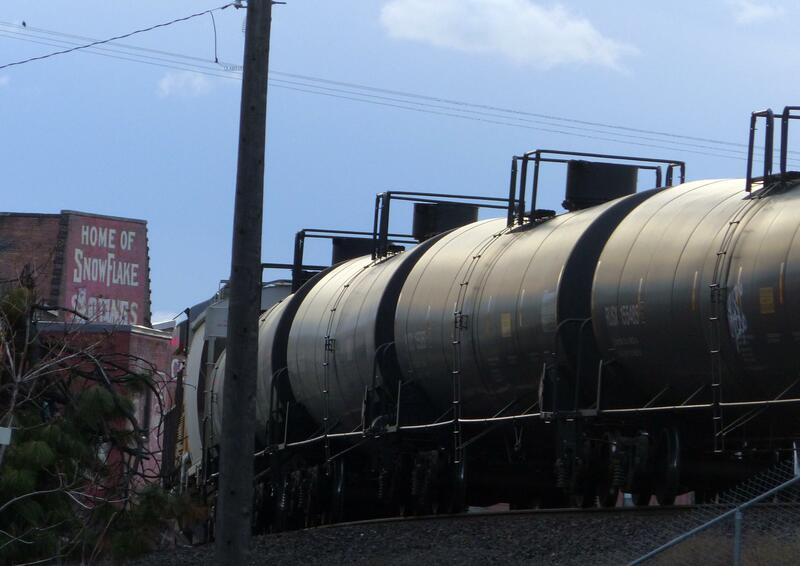 Oil regulators in North Dakota say stabilizing oil in train cars would cost about $2 a barrel, or around 5 cents per gallon. They also disputed that the threat of legal action should scare voters from supporting the initiative. Published: Oct. 14, 2017, midnight Updated: Oct. 16, 2017, 4:34 p.m.